(1) As the image above is first shown the narrator is saying, "the greatest armament salesman the world has ever known" helped sell British weapons to Germans prior to World War I. (2) The elusive Zaharoff is secretly filmed by a freelance March of Time cameraman. (3) The graves are shown again at the conclusion of the film. 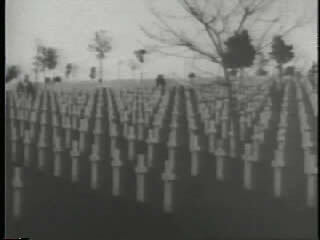 The narrator notes at the beginning of the segment that "The only ones to profit from war's destruction are men who make its weapons," a statement punctuated by images of graves. Zaharoff's job for 50 years "has been to foment war and supply all nations with weapons of destruction." He is "the chief adviser, the wisest and the richest of the dealers in death." The film dramatizes a meeting of the steel barons, and the narrator intones that "working together, these racketeers for their own profit have rearmed Germany in spite of the Treaty of Versailles....They are destroyers of the peace accord and nothing short of that." In this radio segment, The March of Time dramatizes the British Parliament debating the "huge war preparation budget." Members of Parliament complain that Prime Minister Chamberlain's budget ignores the question of war debt to America—36 million pounds worth. One member says, "I'm not sure the Americans will understand our spending huge amounts on armaments and cold bloodedly ignoring our World War debt to them. Where is our self respect?" Winston Churchill is re-enacted as well. He doesn't want to be a debt defaulter, "but at our gates has loomed a prodigious and profoundly alarming figure which makes America's $180 million dollars look like a handful of coppers. Eight billion dollars—$1,000,600,000 pounds—that is the increase in Germany's expenditures for armament since Herr Hitler came into power. Gentlemen, how can we pay for the last war, when we know we must defend ourselves against such preparations of Germany for the next war?" 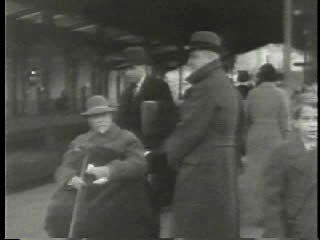 This segment dramatizes the Nazis' arrest of a French coal miner, Charles Galliard, in the Saar region bordering France. A Nazi official announces, "your so-frequent visits to the German Saar provoke suspicions," before the Frenchman is sent to Saarbrucken jail. Galliard was formerly a French administrator of the Saar coal mines. Galliard is presented as only an example by the narrator, "the latest spy suspect along the tense Rhineland frontier." 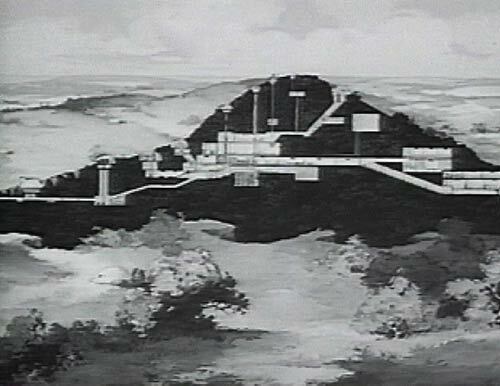 The French are acting on reports that coal mines are being dug into their line to destroy the French fortresses from underground. There's fear that "Nazis have outsmarted France's famed perfect defense." If so, the Maginot Line of underground fortresses may be vulnerable to attack from beneath. While England's army is short by as many as 40,000 soldiers, England has discovered that more than half of new applicants are underweight. Socialists thus make their case for providing for the underfed. Further examination reveals that the British are not eating too little food, but the wrong kinds of food. Subsequently women and men "get busy building up their biceps for king and country" through four meals a day. "For Britons now realize that whatever may be ahead—war or peace—the future well-being of the empire will depend on a fit and vigorous people." 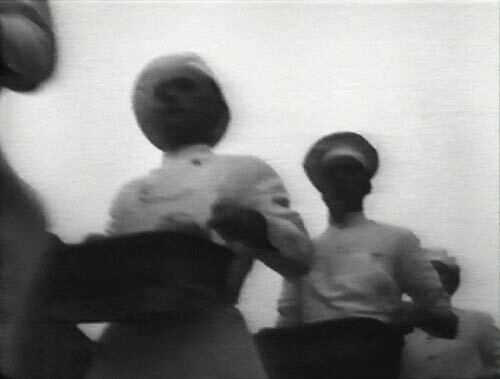 At right, (1) shows an underfed applicant to the army meeting with doctors; (2) reveals the marching chefs were as important as marching soldiers in keeping the country healthy; and (3) was shown at the conclusion of the segment—likely invoking parents' protectionist feelings toward their children. Britons honor the war "when Britain hoped to save the world." In London's White Hall, King George VI honors the dead and salutes the peace "so dearly won." Two minutes of silence are interrupted by a man exclaiming, "what about the living, millions of us, who don't have enough to eat. [scuffle ensues]... Why don't you stop all this hypocrisy. You know you're deliberately preparing another war!" The narrator reveals the upset man was an escaped lunatic asylum inmate. In the House of Commons, the Secretary of State for Foreign Affairs introduces a new bill to protect citizens from air raids during war. The amount of bombs that were dropped on the British Isles in four years could be dropped in 24 hours now. The House discusses methods for protecting and equipping people in preparation for war. "London is now less than an hour by air from the continent. If Britain goes to war, we cannot hope to escape for long the type of warfare which has been carried to the citizens of Madrid and Shanghai," one member says. "If Britain goes to war there may be much, perhaps everything, to rebuild." 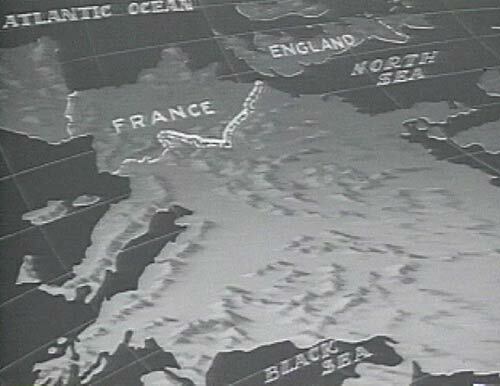 France is the final line against encroaching Germany, 1 and 2. (3) Casual French soldiers and (4) training. (5-6) Diagrams of the network of underground fortresses. 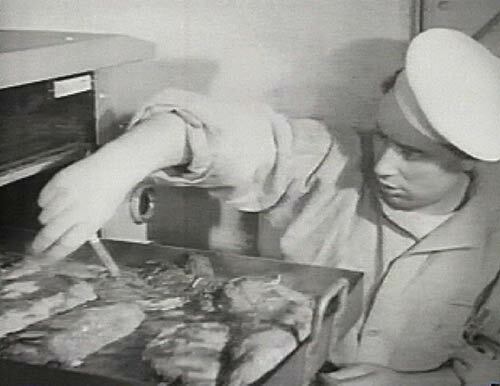 (7) A soldier prepares food for men in the fortress and (8) officers celebrate their successful training exercise. The narrator opens with the announcement, "Today there is no nation in all Europe more firmly resolved to protect its civilization and defend its national liberty than France." Each fortress in the Maginot Line is constructed to withstand indefinite siege, so "When France's premier Eduard Delladier returned to Paris with the truce of Munich in his pocket, none understood better than the French people that the world purchased this peace from Hitler and paid him in full." 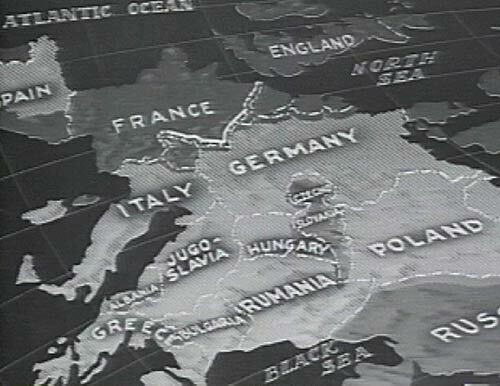 France is moving to construct a new strategy for war because of shattered alliances with eastern Europe as a result of the Munich Pact. 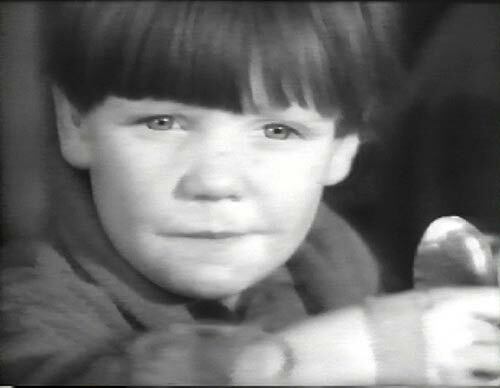 The film assumes the Pact will bring some peace, if backed up by armaments. An intertitle notes that, "Long familiar with the costs of War, the world's democracies are today learning the costs of Peace." France's nation of hard-working peasants and small businessmen must be defended and their ship lanes must be open to imports and exports. The narrator proclaims, "In the world today, nations strong in arms are the safest from attack." France has had a compulsory military service requirement for over a century, beginning when a soldier turns 20. "How France turns its citizens into soldiers, how it builds them into a great army, is being closely studied today by other democratic nations where universal military service has been proposed." France is held up as a model, despite images that show French soldiers acting casual (3): "In comparison with soldiers in armies where strict attention is paid to every detail of military dress, a company of French recruits may appear slovenly, but French drill sergeants are well satisfied, for the young Frenchmen whose father and grandfather served their terms in the same army, is a born soldier, quick to adapt himself to military life. In contrast to life in other European armies, the French recruit lives under mild discipline and he is made to feel that service in the army is not a punishment. After a few months of training, while their bearing may lack traditional military smartness, French recruits are on their way to becoming soldiers and technicians who know how to handle all the complex mechanisms of the modern army." 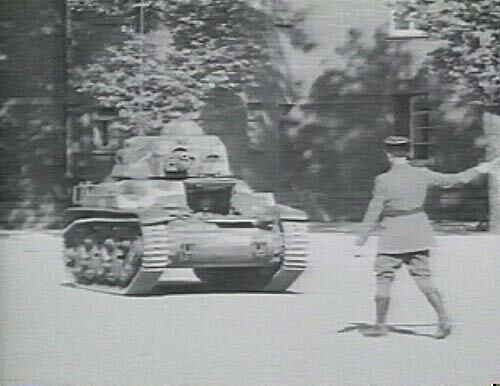 With the last statement, we see a man directing a tank from the ground, pointing the direction to turn. (4) These statements put an optimistic spin on the French military but do not quite inspire confidence. 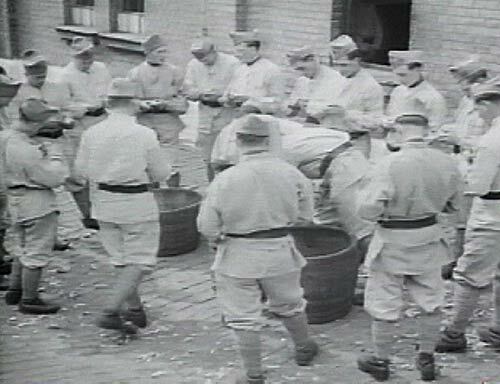 The film then shows a number of field exercises, because "it is in the field that soldiers are made." Some of the French military values seem contrary to military teamwork: the French soldier learns to act on his own initiative whenever necessary, and must be a leader and self-reliant. "In no other army of the world is intelligent teamwork so evident as the teamwork of French soldiers trained to think for themselves." 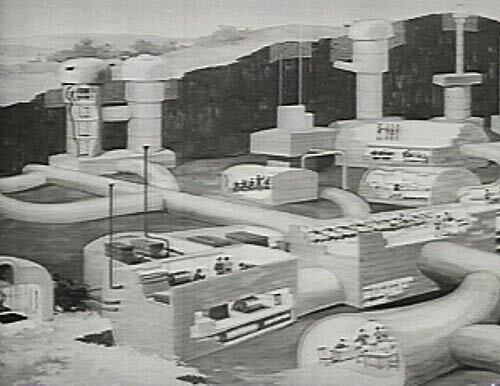 The film segues into annual maneuvers of the armies of France, including moving large armaments toward the Maginot Line to trains for an imaginary invasion there. The French are determined "that France shall not again be invaded." The narrator rattles off a number of statistics about the fortresses meant to reassure: for example, there is enough food to sustain 250,000 officers and men for a yearlong siege (7). 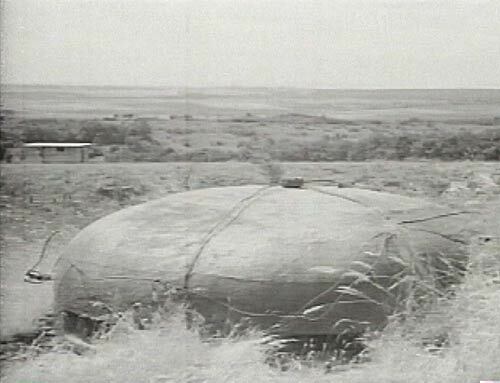 The narrator explains, "the strength of the Maginot army is measured by the efficiency of its men," as the soldiers go through a surprise drill. That it's actually a surprise seems unlikely, with cameras rolling. The scene is dramatized by music that sounds like a film chase scene. At one point a cannon points straight at the viewer—then moves away to show an actual shot fired. The narrator offers some final reassuring words: "And just so long as the world has armies, so long will they remain inside the Maginot Line, the men to whom France entrusts her liberty, the soldiers of a free people, the army of France. 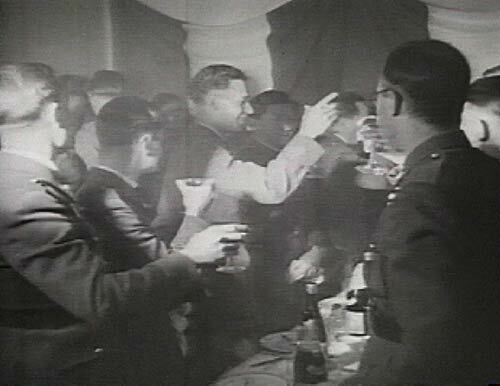 [Soldiers are shown toasting, then the segment cuts to a shot of the fortress outdoors. (8-9)] Time marches on!" 1 Fielding, Raymond. The March of Time, 1935-1951. New York: Oxford University Press, 1978. 53. 2 Fielding, The March of Time, 1935-1951, 264.